Another day just like the last few. Bright and sunny this morning. The over night low was 38F and the high for the day was 62F. Again the wind was negligible. Spent the morning going through drawers and sorting things out. Set up the satellite and Honda generator. 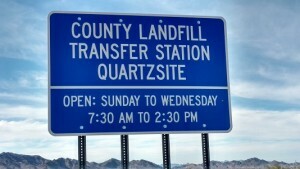 Took the garbage over to the Transfer Station. It is open Sunday through Wednesday from 7:30AM to 2:30PM. They were filling up the roll offs pretty fast. I had gotten out a power supply cable for Alan and he came to pick it up. He brought along some oranges for us and some DVDs to watch. He is going to bake some beer bread and needed beer and brown sugar which we had and sent along with him. Cathy made him promise to bring her warm bread. Cathy combined our left overs from eating at Times 3 Family Restaurant last night and heated it in a pan on the stove. It was really good. I believe the tortillas are the best I’ve ever had. Watched HGTV for the rest of the evening. I’m not able to get local channels here, although I could at Hi Jolly. I’ve created a new travel itinerary and we will be staying here until January 19th. We will then move to the La Posa South LTVA for a night. We can buy the $40 permit and it will cover our stay here and at Imperial Dam. By moving we will be able to dump and fill with water before we leave. On January 20th, we will move to the Fountain of Youth to visit Dug and Rhoda. We will then go Mission Viejo to visit my cousin Kathleen then on to Imperial Dam for a week.